Bernard-Thadée Petitjean (ベルナール・プティジャン, 1829-1884) died in Nagasaki on October 7, 1884 (Meiji 17). In 1865 (Keio 1), he discovered that almost all the villagers of Urakami (浦上) in Nagasaki were Christians. These are now known as Kakure Kirishitan (隠れキリシタン, Hidden Christians). See Hidden Christians in Nagasaki Come Out of Hiding. Petitjean was born in Blanzy-sur-Bourbince, France on June 14, 1829 (Bunsei 12). 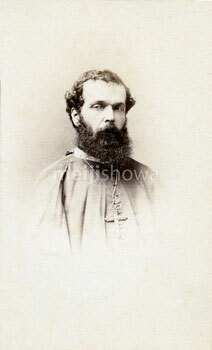 On May 21 1853 (Kaei 6) he was ordained as priest with La Société des Missions Etrangères de Paris (パリ外国宣教会). 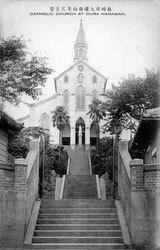 By 1862 (Bunkyu 2), he was in Yokohama as a missionary for that organization. 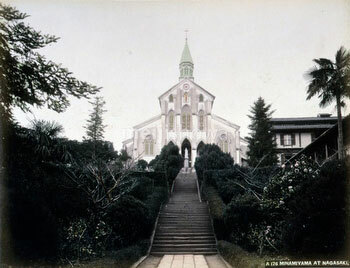 By August of the next year, Petitjean was in Nagasaki to oversee the construction of Oura Cathedral. It was dedicated on February 19, 1865 and less than a month later the Kakure Kirishitan approached him.